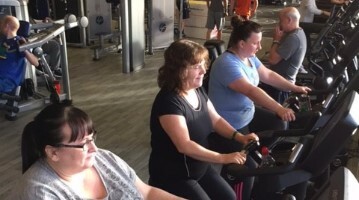 "Get Moving with Counterweight" is a free 12 month group programme which supports you to make small changes to your diet and lifestyle to help you to manage your weight and become more active. It is a healthy lifestyle programme funded by NHS Lothian in partnership with local authorities. The initial 12 week group programme consists of 6 fortnightly dietary and behaviour change sessions which will support you to make the small changes required to lose 5-10% of your body weight. Each session lasts one hour and the groups are small with a maximum of 12 people. After the 12 week group programme there will be drop in weekly weighing sessions and follow up group sessions at 6, 9 and 12 months. What can I expect at the Get Moving with Counterweight Sessions? By the end of the programme you have the skills to manage your weight for life. 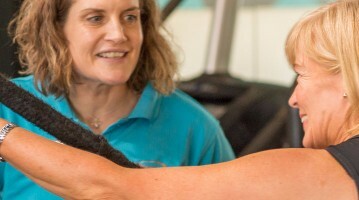 Alongside the dietary and behaviour change sessions there will able be physical activity classes, in the gym and studio, on offer to help you become more active. These vary in duration but will last for a maximum of 1 hour. Groups are small with a maximum of 12 people in the session to allow us to monitor you closely and provide individual support if required. All sessions are supported by our Get Moving supervisor who is qualified to work with individuals with a range of health conditions. This will allow the Get Moving supervisor to tailor the exercise to your specific needs. All participants will receive a Get Active Card giving subsidised access to physical activity. How can I access Get Moving? Access to the programme is by referral from your GP/Doctor. Your GP will refer you to the weight management team and they will send you a letter asking you to contact them and book into the most convenient group for you. Edinburgh Leisure runs groups throughout the city in our venues and community centres, during the day and in the evenings. Am I suitable for Get Moving? Get Moving with Counterweight is suitable for individuals with a Body Mass Index (BMI) of more than 30kg/m2 and a weight less than 160kg ( 25 stone 3 pounds). You can figure this out here. If you would like further information on the Get Moving with Counterweight Group Programme please call our NHS partners directly on 0131 537 9533 and they will be happy to tell you more. Alternatively, if you have any additional questions you can contact our Weight Management staff via active@edinburghleisure.co.uk. You may also be interested in Get Going, our family healthy lifestyle programme funded by NHS Lothian. It offers support to help children (aged 5-11) and young people (12-17) to get active, eat well and achieve a healthier weight.